As Missy and I walked out the door for our walk, a philosopher's hat fell on my head and sent my mind spinning like an errant pinball bouncing off walls. It finally landed in the well-worn rut of "two types of people." You know the one ... there are two types of people ... introverts and extroverts, people who garden and those of us who have brown thumbs, people who adore Sarah Palin and those who think she has horns under her perfect hair. Of course no one is all one thing or the other ... even though I was thoroughly befuddled by John McCain's choice of Sarah Palin as a running mate, I admire her chutzpah and energy. After all, who among us would be willing to open up our darkest corners to the scrutiny of the press and public the way any political candidate has to do these days? Anyway, my mind started running down the "two-types" of people channel and wound up with: some people are story makers and some people are story tellers. Occasionally, of course, someone combines both into a charismatic and enchanting combination and we wind up with a Steve Irwin, Bill Bryson or Oprah Winfrey. We all make stories and tell stories but I've observed a shift ... young people seem more focused on making stories. Everything is new to them so their lives overflow with stories told and untold. Those of us of a "certain age" seem to grow increasingly focused on telling stories, often stories from ten, twenty or thirty years ago. Sometimes it seems like we're repeating and retelling the same stories with minor changes in characters, places or details. I think it's perhaps the balance of story making and story telling that keeps us young, at least in mind and spirit, perhaps even in body. As we have experienced more and more of life's wonders and hazards, it becomes more challenging to make new stories, since, by definition, that means discovering and experiencing something new, something that might be outside our comfort zones, something that might actual rock our well-crafted world. Yesterday I met a woman who reminded me that new stories still wait for me. ReAnn Scott (check out her blog) wandered into Timberline Art Gallery where I was the curator of the day (fancy word for sitting there greeting people). ReAnn and I fell into a conversation, discovering a few common connections ... writing (she is a travel writer for AAA and AARP), art and life ... and a few less common connections such as her re-entry to the world of the Peace Corps and her life since losing her husband eleven years ago. ReAnn is a story maker and winds up trailing a bushel basket of fresh and funny stories behind her. What normally would have been a brief encounter in the gallery turned into a 24-hour gab fest as she accepted an offer to spend the night in my spare bedroom. ReAnn is an adventurer and I heard about her Peace Corps time in St. Kitts (it's not an inspiring story for this almost-Peace Corps volunteer but you can read about it at her blog Re's Adventure in St. Kitts/Nevis. The title of one post probably summarizes the bottomline: "Don't let the Peace Corps ruin your Peace Corps experience"). She also told me about teaching English to businesspeople in Spain, work-camping at various places around the country, her part-time work demonstrating tablet computers, living with her high school sweetheart as an ex-pat in Mexico, her mother who got married for the third time in white leathers at Sturgis, and her plans to sell her house, buy an RV and travel "until I can't drive any more." Visiting with ReAnn was liking drinking from a fire hydrant but it reminded me that life is not over till it's over and time is mine to make of it what I will. I'm going to make a new piece of art to remind myself to Make More Stories! What new stories are you making? About this image: "Compassion." 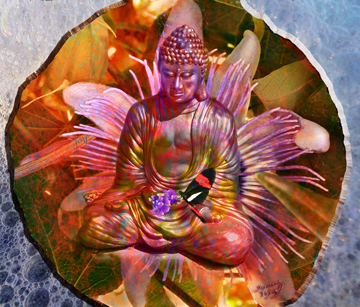 The Buddha sitting in the midst of a passion flower holding the most delicate symbol of transformation reminds me of the importance of compassion ... for others, for ourselves, and for change that seems almost incomprehensible at times and yet leads us into a completely new stage of existence. Amazing, isn't it; you meet someone and share the gift of stories, as if you've known each other since whenever. Imagine all the stories your Buddha has heard. What a terrific post, and what a wonderful fresh look at this subject! I've just forwarded this post to my husband... thank you! Maureen and Diane ... thanks for the comments! Stories are indeed a gift. What a blessing, and thank you for sharing with us. One never knows who will walk in any door, and we have to be open to connections. How trilled am I to be the one who walked in the door and now have a new friend. Like you said, its as if we've known each other forever - because we shared our stories Next...Burning Man in my new RV!